How do you watch an entire continent as it moves? The proposed EarthScope project would allow earth scientists to study North America on a continental scale. Land management requires good earth science, especially for one of the country's most significant land-owning populations: Native Americans. Do you love science and writing? Advances in science and technology are keystones of economic prosperity. We need to support a broad portfolio. It is going to take a major effort by the geoscience community to convince Congress to fund EarthScope. But the long-term payoff will be worth it. Dry spell in the Eastern U.S. The Cryobot: It burrows, it melts, it collects. 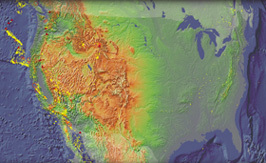 The continental United States (pictured here rotated 90 degrees) is home to active faults and volcanoes. In this image, yellow dots indicate earthquakes with magnitudes of less than 6.0 that have occurred since 1980. Open circles are earthquakes between magnitudes of 6.4 and 8.0 that have hit since 1900. Triangles represent major volcanoes, white lines represent active faults, and the red circle and triangle in the center mark the Yellowstone hot spot. Earth scientists still have many questions about the structure of the North American continent and how all these dynamic processes relate to each other. Read story. Photo supplied courtesy of the IRIS Consortium.